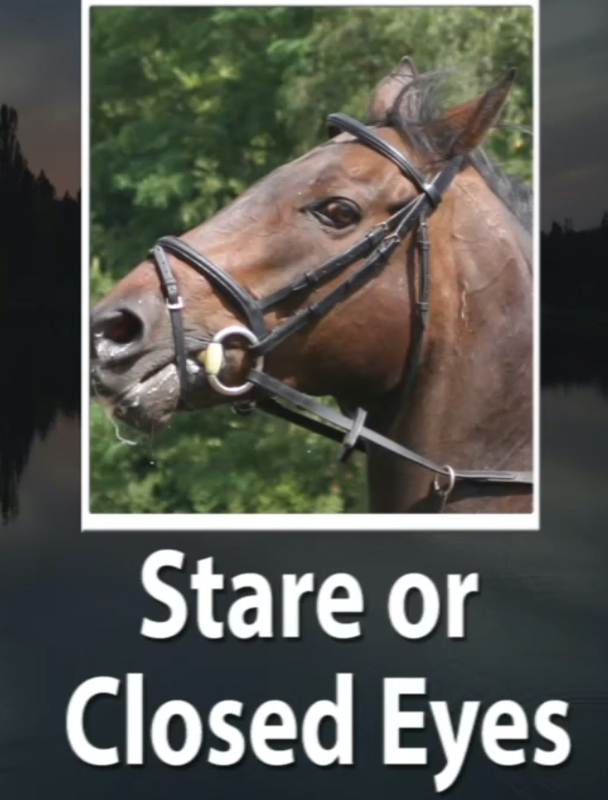 Horse Body Language – What does Pain look like? 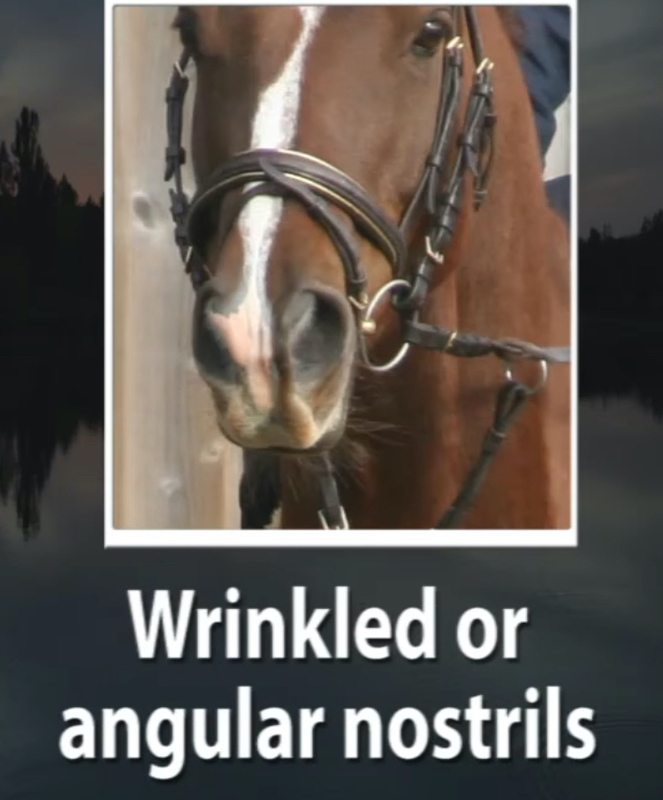 How accurately can you, your vet, or your trainer, read your horse’s body language and facial expressions to determine whether your horse is experiencing pain – even if your pony is not limping or showing any outward signs of injury? Dr. Sue Dyson – Head of Clinical Orthopaedics at The AHT – has developed an ethogram depicting pain signals in horses’ facial expressions and body language. 1. 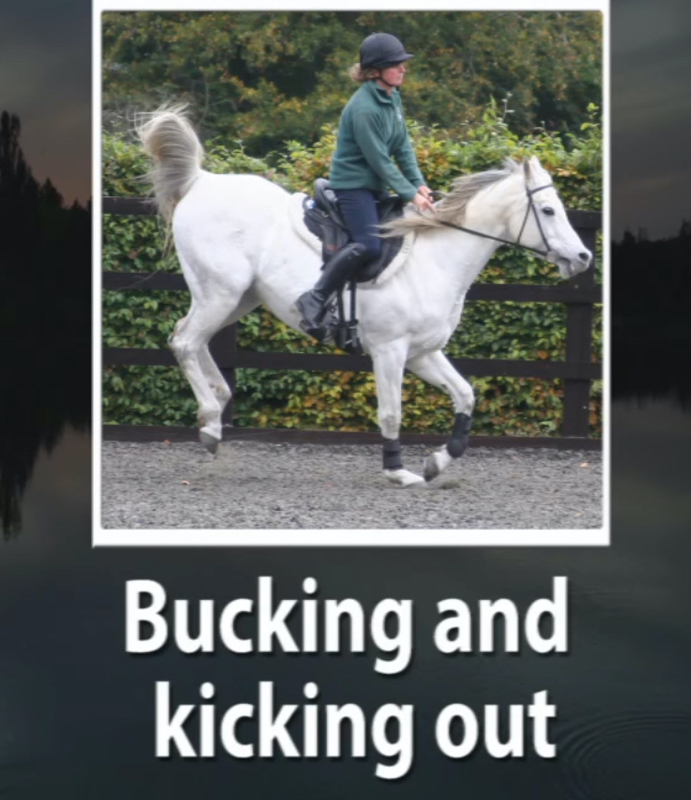 Bucking and kicking out after jumping a fence – especially if ears are pinned back. 2. Spooking repeatedly at jumps, or not wanting to go into a corner. 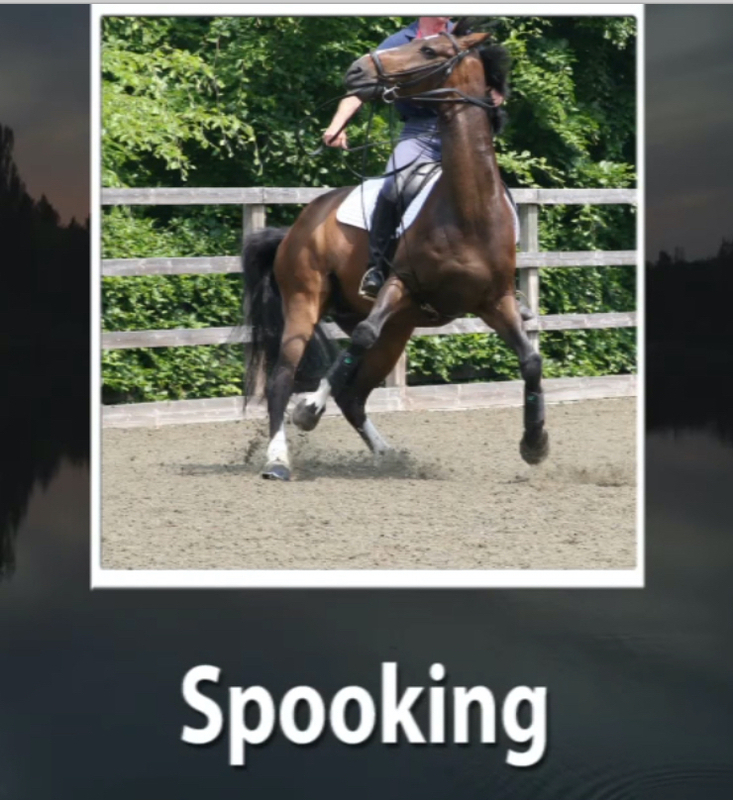 Especially if horse is spooky every day, in its home environment. 3. Horse’s behaviour when being tacked up or mounted – fidgeting a lot can mean the horse is anticipating pain. 4. Look for these obvious facial expressions of pain: Ears back, eyes open, unsteady head carriage. Okay. So. After having a scroll through those pictures in succession, is your mind going where mine is?? 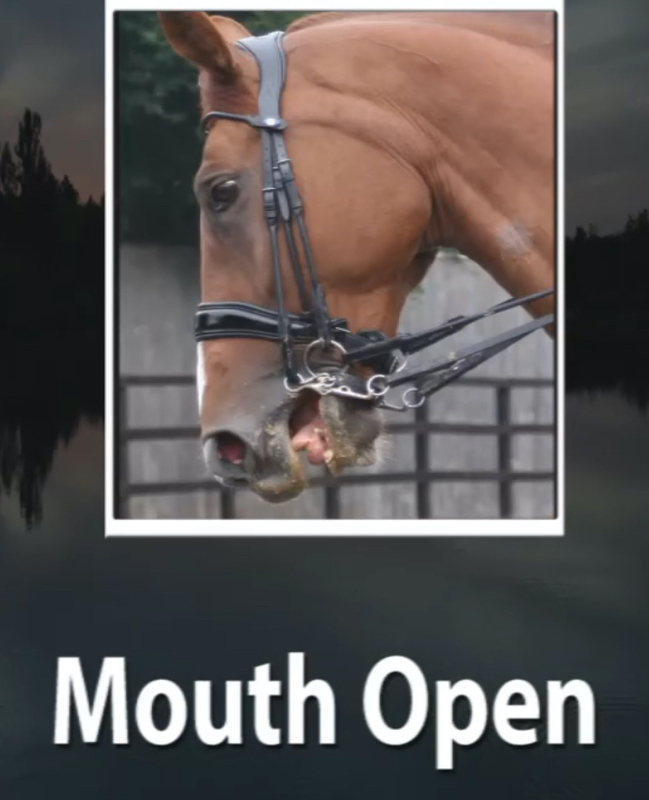 I would love it if someone would sit down with video footage of a jumping, dressage, or any other competitive equine event and find footage of any horses that are NOT displaying these pain signals! 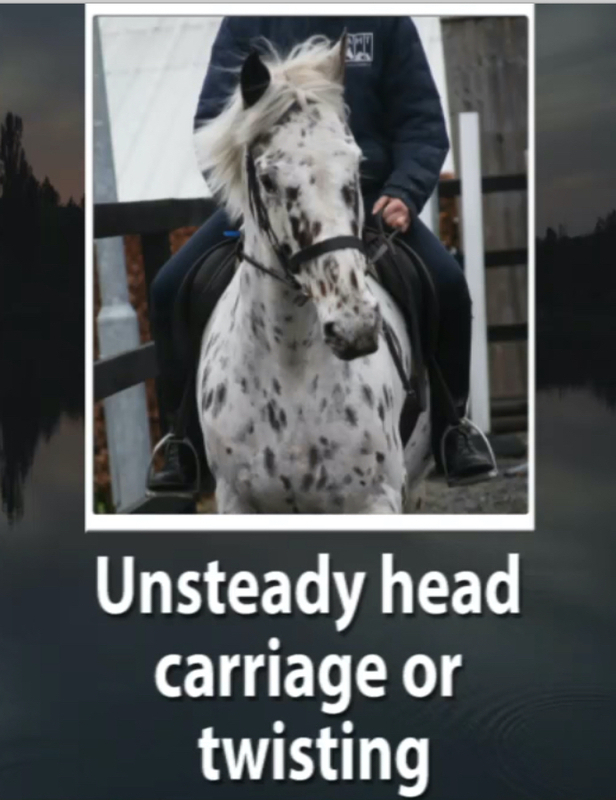 Also interesting that most of the facial expressions indicating pain are while the horse is wearing a bridle. So is the pain coming from the legs, back, or the bridle (bit, straps, pressure) itself? 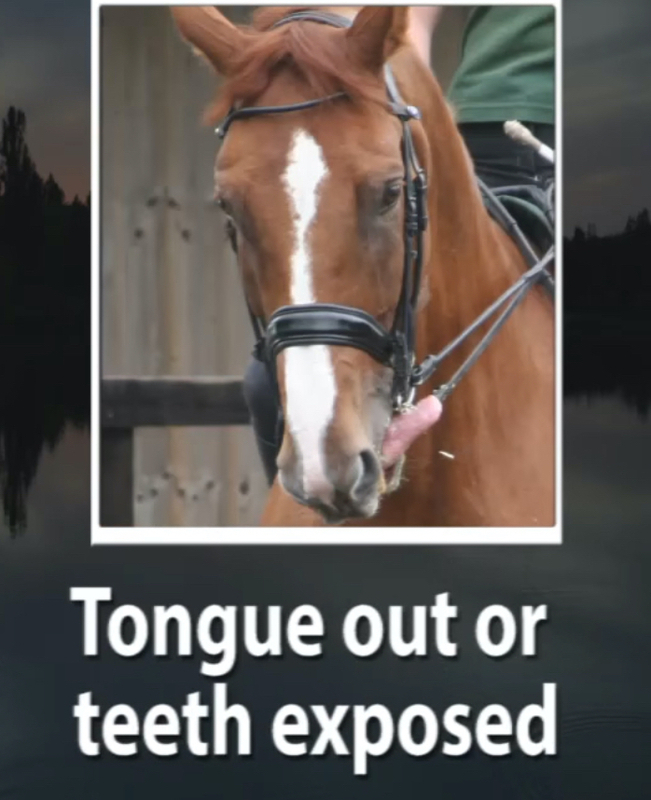 If I were a vet, I would want to see the horse being ridden without a bridle – just a halter and loose reins – and evaluate the facial expressions again. Dr. Dyson says the really frustrating thing is that the average equine patient she sees – when she goes back over the history with the owner – has usually had the problem for 6-9 months. So now she has to deal with a chronic problem/injury that would have been much easier to treat if the horse had been brought in earlier. 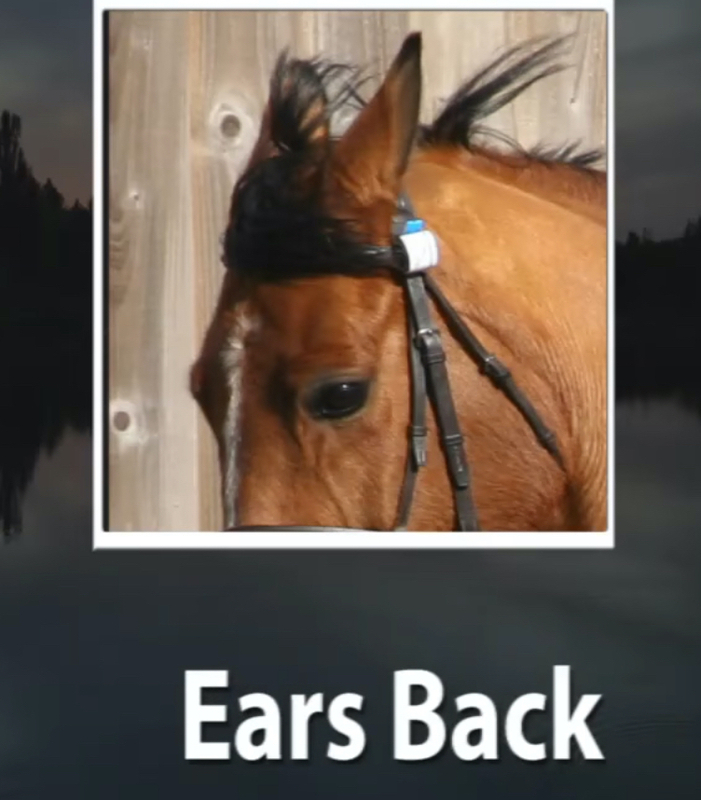 She is hoping that by spreading awareness of these pain signals in equines, that owners will get their horses the help they need, faster. So the likelihood of successful treatment would also increase. It occurs to me that this faster approach would not only be much better for the horses, but also likely cheaper for the owners! Dr. Dyson also hopes that her fellow veterinarians will learn to recognize facial pain so they get better at diagnosing lameness. 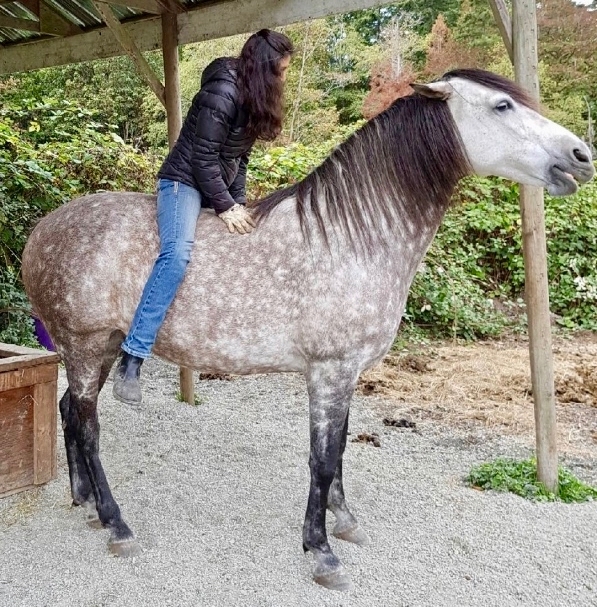 And she suggests that vets study facial expressions and body language when the horse is being ridden, as well as being led around – because many issues or pain points don’t show up until a rider gets on the horse’s back. Although it’s ideal if you could find a vet, a trainer and a ferrier that could talk to & listen to your horse, as well as reading their body language, in the meantime, this alone is a huge step forward for most riders and their veterinarians. Excellent. People need to become aware of the horse’s way of showing us that he/she is in pain and not chock it up to naughtiness! Exactly! A friend rode at a hunter/jumper barn and I saw ALL of these pain expressions there. 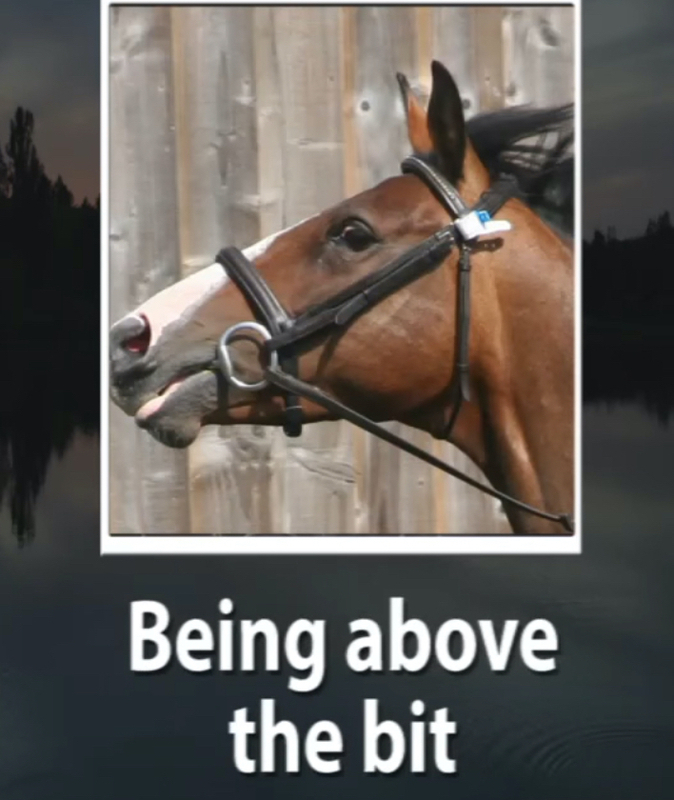 But in every case, the instructor labelled it: naughty, bugger, lazy, trying to get out of doing the work, jerk, don’t let him get away with that, trying to get one over on you, don’t let her take charge, and so on. Tragically, not once was the behaviour correctly interpreted as a pain signal. Why do you think that is? Why as a species on a whole, in regards to horses, do we never think to contribute a horses behavior to pain? I am guilty of this too? 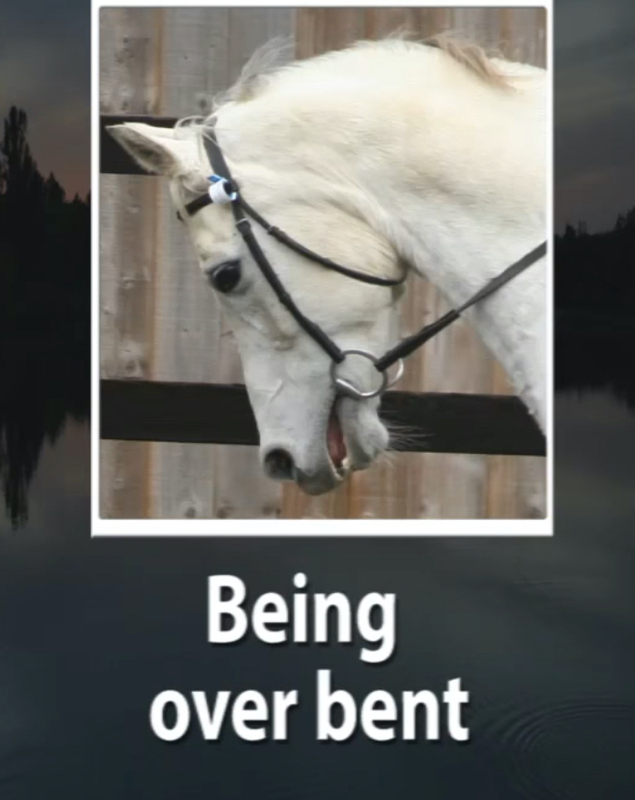 The thing is I would be way more likely to contribute weird/unusual/negative behavior of my dogs to pain, but when it was my horse I didn’t listen to my intuition & refused to reconise he was in pain until he about had to slap me across the face. I won’t go into all the details because I know I have in a previous blog reply. At least I do feel I have learned deeply from that particular incadent and will try and always consider pain as the first reason for unusual behavior. Breathing is another thing that really is a clue about pain. My boy had very different breath sounds when he was in pain. As usual thanks for putting this very important info out there. ✌?️❤️? I think perhaps because of the whole fear-anger-protective-macho response that horses trigger in humans! You’ll see the same default setting in us with adolescent males. We don’t look for the pain – we respond to the signals with discipline, boundaries, aggression. Dogs, daughters, cats and other smaller, non-physically-threatening critters don’t trigger the same response. That’s my theory! I think that so much of what is largely considered “normal” for horses is braided through with pain. So much of riding and training actually hurts horses, from the tack to the methods to the simple trouble of carrying a human on a spine that isn’t actually designed for that and so much more…while I do think riding can be done in a fun and constructive way for the horse, very little of it is actually 100% geared toward that. And people (many of us can attest to this) love their horses, so the cognitive dissonance (the inconsistency between our perceptions [“gahh! pain!”] and our beliefs [“this is fun and cool and the right thing to do!”]) is too much and the perceptions are forced underground or explained away no matter how weirdly (attributing expressions of pain to “naughtiness” or “trying to get his way” or general sass). I know I struggled with this, because even when I switched to a more relationship-based approach when I found the traditional to be not-my-cup-of-tea, I still blindly accepted that riding was essential. So I thought all my horse’s reactions must be directed at me or based on her psychological state, took a lot of it personally, and did not help her resolved her pain until it finally dawned on me that she might…be…in pain. Durr. For the record, she got me up on her back yesterday… no grunts, no flinches, no twitches, no moving off, just a sweet offering to let me know…she is doing a-okay ten years later. I attended the rodeo in my community because I just had to see. This picture sums it up. …So I’m leasing a small QH. This past winter, the trainer I was working with refused to listen to me when I said I was pretty sure something was wrong, and insisted that he was just being “sassy,” and after three months (about the beginning of March) it escalated to the horse rearing up so hard he flipped over, then managed to roll onto his side and stand up. I fractured two vertebrae (L1 and L4) and my hip, broke several ribs, and got a concussion. Twelve weeks later, both the horse and I were 95% good as new. The issue was with his feet, which affected all of his joints above them as well as his back, and that was fixed with some sort of rubber shoe. I’ve ridden him twice since all of that, and aside from him fidgeting while being tacked up the first time, he’s shown none of the pain-signs. I’m a little afraid of riding him for very long now, but we’ve been working on having a functional relationship while on the ground.